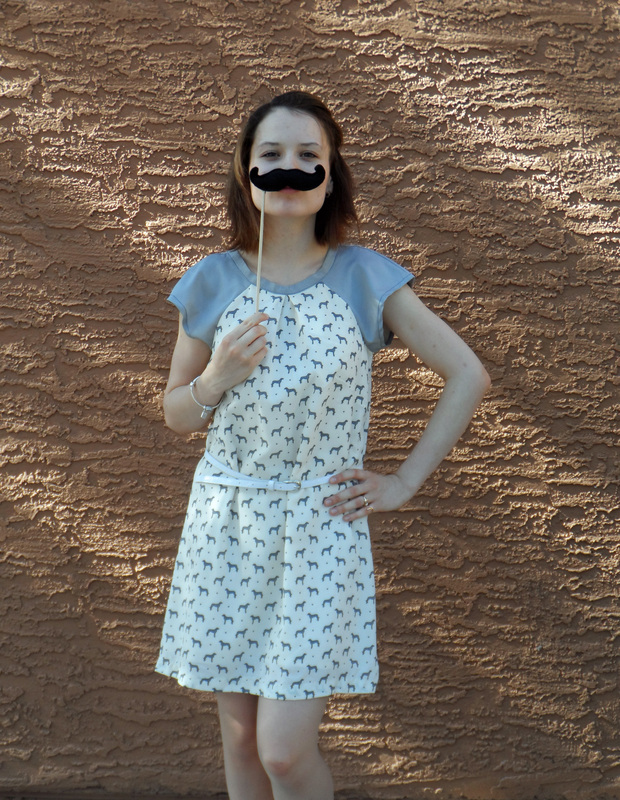 Printed T-shirt dress with raglan sleeves and… MUSTACHE! :) – Go ask Alisa – DIY capsule wardrobe one stitch at a time! As a result of these things from my “don’t do list” I have this gorgeous and… silly grey dog printed T-shirt dress with raglan sleeves. I honestly do not know what happened to me, we were walking through Walmart, buying some laundry soap and etc., and I just saw this fabric and felt completely charmed by it. I could not leave without buying a yard, so after 35 minutes of waiting for the person in the fabric section to cut and label the fabric I left happy with a T-shirt dress idea in mind. Same evening, 6 hours later I created this dress. It is fully lined, sleeves are made out of grey/silver crepe, bottom hem is hand stitched. I got one yard and still had a pretty good amount left over, would be enough for some detailing or little purse. Pattern wise I used New Look’s pattern of raglan sleeve blouse and extended it in length. Added a belt and here we go! That print is really cute – no wonder you couldn’t pass it up! 🙂 Great dress! Previous Previous post: Weekly photo challenge: SPRING!